My Bar Mitzvah* changed the way I think about the world around me and has left an indelible impact on my life. No, I’m not writing this the morning after my entry into Jewish adulthood. This is not a musing on how it felt to lead my congregation in prayer, or how great it was to celebrate with my friends and family. Rather, my Bar Mitzvah was over three years ago, and what really changed my life was a friendship that started out as my Bar Mitzvah community service project and has evolved into one of the most treasured and important bonds of my young life. In 2010, I was faced with the task of deciding what to do for my “Mitzvah Project,” an act of community service to be completed in the year leading up to my Bar Mitzvah. As an avid learner in general and a history buff in particular, I decided that I would get the most out of this project if I were learning while I did it. I reached out to Heritage Pointe, a Jewish retirement community in Mission Viejo, California, for the residents there had lived through the modern history that I spent most of my free time reading about. 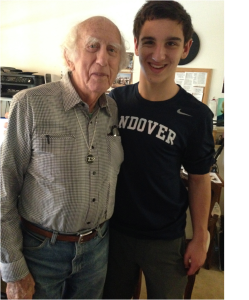 There, I met a Holocaust survivor named Ziggy Silbert. Initially, my interactions with him were merely an engaging way to fulfill a service requirement, yet, long after my Bar Mitzvah has come and gone, Ziggy remains a faithful friend. Actually, he has grown to feel like an additional family member. In the countless hours I have spent with him, we have laughed and cried; told jokes and partaken in intellectual debate and discussion; spent an afternoon strolling through a garden and sang along as we watched the stage and movie productions of Les Miserables. We have both gained so much from our friendship, and I have truly grown to understand of one of the world’s most traumatic events as seen through the eyes of one of the world’s kindest men. Over the next few weeks I will be completing a fuller reflection on our relationship that will be posted on this site. I hope to share with readers the lessons I have learned from the living history I have faced, and I very much hope I can do justice to Ziggy, a remarkably special mentor, friend, and human being. Click here to read Justin's full post. *A Bar Mitzvah is a ceremony for Jewish teens that marks the entrance into adulthood. I am from Southern California and just completed my second year of boarding school at Phillips Academy Andover in Massachusetts. I am the captain of the varsity wrestling team, play soccer, participate in the chess club, and work as a tour guide. I also write for TheBootleg.com, Stanford University’s football fan website, am a charter content creator at YourSports.com, and have published two books, Straight-A Study Skills (2013) and recently-released The Boarding School Survival Guide (June, 2014). You can email me at boardingschoolsurvival@gmail.com or follow me at @BoardingSchl on Twitter and at The Boarding School Survival Guide on Facebook.